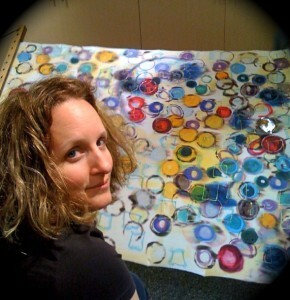 Rebecca began her silk painting career under the instruction of Alice Tersteeg at the University of Alaska Southeast. Since then, she has expanded her wearable textile business to custom, event silk design and beautiful art pieces for art enthusiasts around the world. Her colorful paintings capture the natural world with simplicity but, with considerable attention to detail. She has had the pleasure of showing her fiber art and watercolors throughout Washington, Oregon, Alaska, and California. She currently resides in Western Washington with her husband of 21 years and their two young children.